Opinion > Opinion > Praying without permit? The most disturbing aspect of the incident involving the recent attack against the Copts in the village of al-Beida in Amriya is not the attack in itself, the damages incurred, or the families rendered homeless; but the preposterous charge brought against them, that of holding prayers without permit. The Amriya incident was not the first in which Copts were charged with worshipping without permit. In 2009, the police in Samalout, Minya, some 230km south of Cairo, caught 32 Copts who were gathered in a house in the village of Dabbous and were holding a service of prayer and hymns. 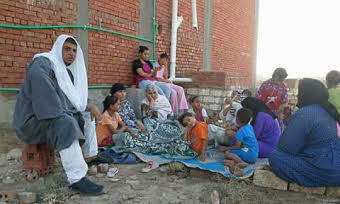 The Copts were charged with praying without permit; they were later released. Again in 2009, the Muslim villagers of Ezbet Bushra in Minya waged an attack against the village Copts and set their houses on fire in protest against their holding prayers in a building owned by one of their community. The police arrested a number of Copts and later set them free, but closed the building under the pretext that it was used to hold religious services without permit. More recently, in 2012 the police questioned the pastor of the Catholic church of Mar-Girgis (St George) in the town of Higaza in Qena, some 550km south of Cairo, for having set up a tin roof above a school owned by the Church, in order to pray under. The village church had been burned in 1993 and the Copts were not allowed to rebuild it ‘for security reasons’. The local Muslims burned the roof and again burned an awning the pastor later set up for prayers in the school courtyard. Last week, the Copts in the village of Rahmaniya in Qena some 550km south of Cairo were jubilant because they were granted a temporary permit by the security authorities to reopen their local church of the Holy Virgin, after 26 years of closure, again for ‘security reasons’. Throughout their long history, Egypt’s Copts have always suffered from restrictions, both official and popular, on holding prayers whether in churches proper or in informal buildings in which they would gather to worship. Old praises for the Holy Virgin still sung with gusto today include the clause: “We ask you, Mother of God, that church doors should be open for the faithful”. In modern times, however, the rampant practice by fanatic Muslims to prevent Copts in Egypt from worship, and the official acquiescence that allows this practice to prevail, violate the country’s Constitution, laws, and international treaties of which Egypt is signatory. Among the several treaties Egypt has signed is the International Human Rights Law which is the body of international law designed to promote human rights on the social, regional, and domestic levels. There is also the International Covenant on Civil and Political Rights which, in its Article 18, stipulates that: “Everyone shall have the right to freedom of thought, conscience and religion. This right shall include freedom to have or adopt a religion or belief of his choice, and freedom, either individually or in community with others and in public or private, to manifest his religion or belief in worship, observance, practice and teaching”. Successive Egyptian constitutions—Egypt got her first constitution in 1923—have all honoured equality between all Egyptians, and banned all discrimination including that based on religion or belief. Do Christians really need an official permit to hold prayers? Ishaq Ibrahim of the rights organisation The Egyptian Initiative for Personal Rights is equally indignant. “The attack against al-Beida Copts,” Mr Ibrahim says, “has exposed the discriminatory bias of the authorities and the double standards they apply where sectarian violence is concerned, especially in case of practising religious rites. Mr Ibrahim says that the insistence of the police on applying the rules of the building law in rural areas on churches but not on mosques reflects the rampant exercise of double standards by State officials in favour of a specific group and to the detriment of another, in this case in favour of Muslims and to the detriment of Copts. This sends a negative message to Egyptians that there is no equality, he says. “It’s a catastrophe; a disgrace,” says George Ishaq, member of the National Council of Human Rights, describing what happened in al-Beida. “When the police charge Egyptians with praying without permit, they should be brought to justice for violating the Constitution and the law, and for practising outright discrimination. For his part, Muhammad Mounir Megahed, Coordinator General of the NGO Egyptians Against Religious Discrimination, sees the al-Beida incident as the natural outcome of the infiltration of Wahabi Salafi thought in the State which, deplorably, appears unable to do anything about it. Quite the contrary, Mr Megahed says, religious discrimination goes on unchecked, and peaceful Copts who demand nothing but to have the freedom to pray are penalised. The Beida incident represented fertile material for the sarcasm of satirical writer Ashraf Helmy. Under the title Worship by republican decree, Mr Helmy wrote in the online al-Bawaba news and posted on his Facebook page that we must admit our failure to put an end to religious terrorism. The reason, he wrote, is that extremist thought defends itself by referring to the Constitution articles which say that Islam is the religion of the State and that Islamic sharia is the source of legislation. Add to that the leniency with which the police treat Salafis, and you have an explosive mixture that erupts with hatred.